“Carbon Cast” is a multi-layered 5mil cast vinyl film with a carbon fiber embossed pattern. It carries the proven solvent-based adhesive and a structured PE liner with Hex’Press technology that allows convenient air egress during application, with its flexibility and high conformability fast and risk free. 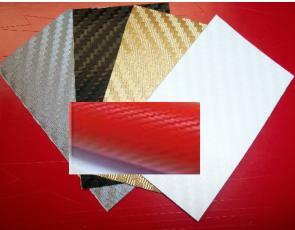 It is principally designed for vehicle full wraps and other long-term, outdoor applications. It is the ideal, high-tech solution for heavily curved surfaces, such as full vehicle wraps, designer furniture, laptops, cell phones and many more. Side Vent Highlight Decals are precut and fit perfectly - no trimming required!